they recieve small pieces of art from 9 different artists, including me. The artists are paid for their work and get to meet the "patrons"
at a local reception. 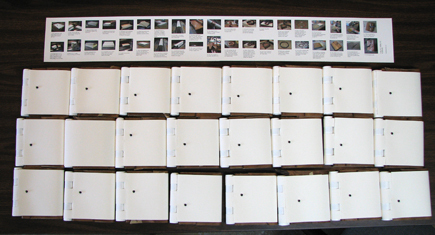 Here are a sequence of photos showing how I created this limited edition of 25 books. The finished product. 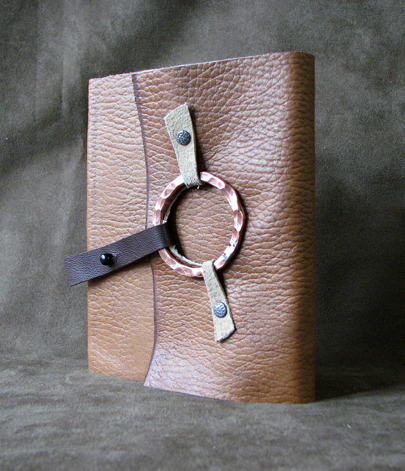 Pages are 4" wide by 5" tall and the cover is a very soft, flexible, rustic, raw-edged leather wrap cover. 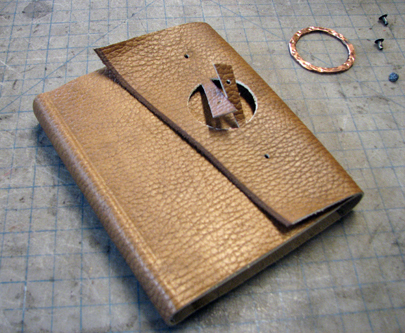 The cover closes with a strap and metal button through a hand-forged copper ring. 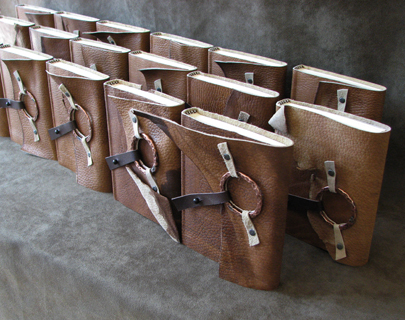 All 25 books for this project have covers made out of the same piece of leather. 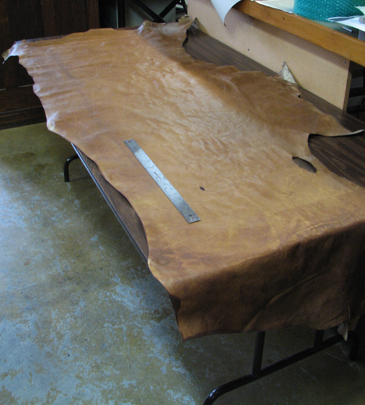 Each one is a bit different due to variations in the leather as well as the various raw leather edges on each piece. 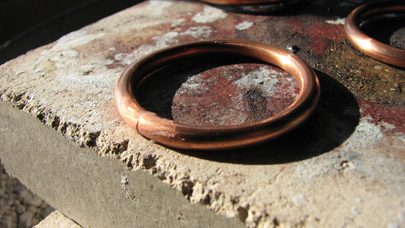 Each copper ring was forged individually and they are hammered to create different textures. 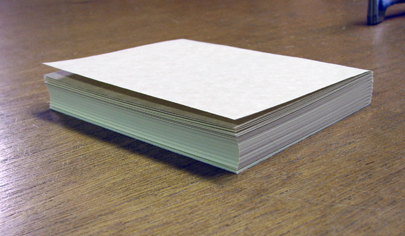 The books starts as a pile of very large sheets of paper. Mohawk Superfine Text smooth finish soft white. 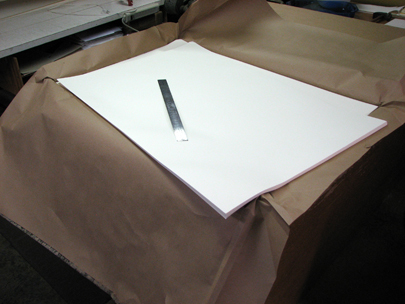 The sheets start out at 25" x 38". 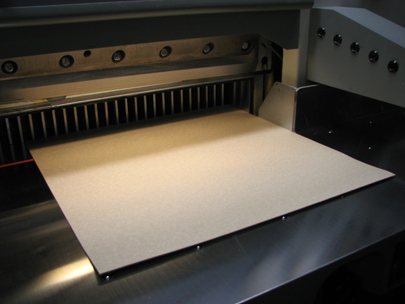 The larger sheets of paper are cut down in the large paper cutter to a size of 8" wide by 5" tall. 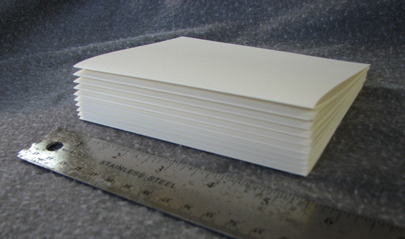 Here is a completed stack of cut pages, with the ruler for size reference. 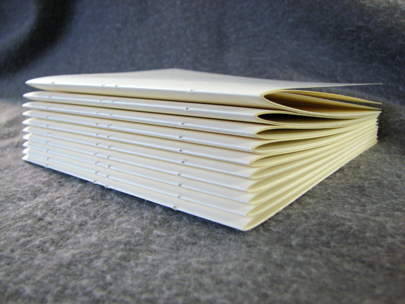 For each book, pages are folded in half and grouped together into "signatures". 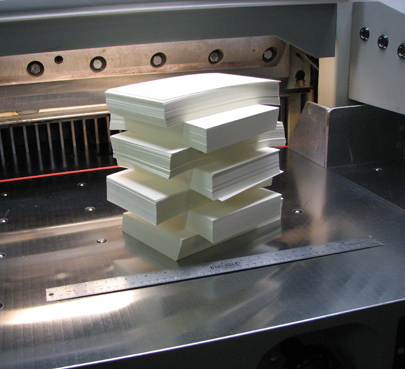 Each folded signature is punched with holes where the stitching will go. This is done by hand with a pointed stylus. The signatures are sewn together, through the folds, by hand with 100% cotton thread. 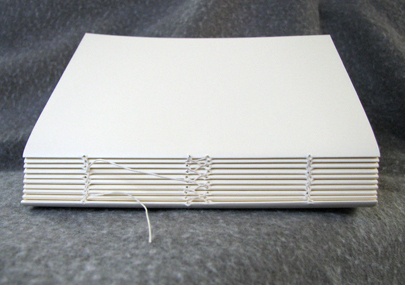 I like to use a chain stitch at each end with a kettle stitch in the center on a book this size. The pages all sewn together. 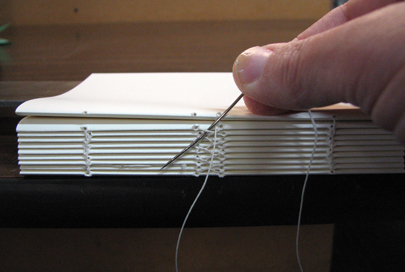 This type of signature sewing allows the book to lay open completely flat, all the way to the back edge of every page. 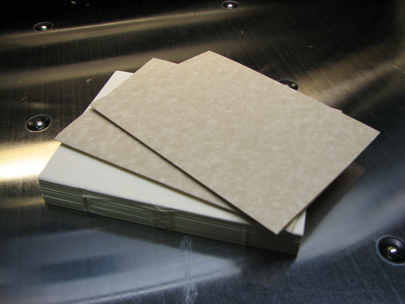 Endpapers are cut from larger sheets of Ecological Fibers desert tan parchment. 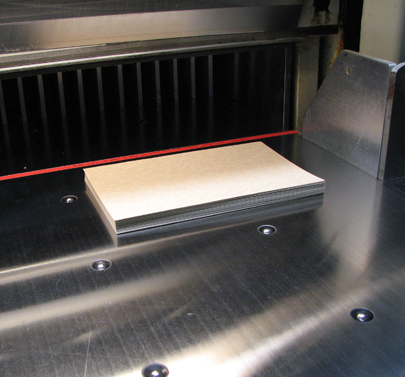 Endpapers are cut in the paper cutter to the same size as the pages; 8" wide by 5" tall. 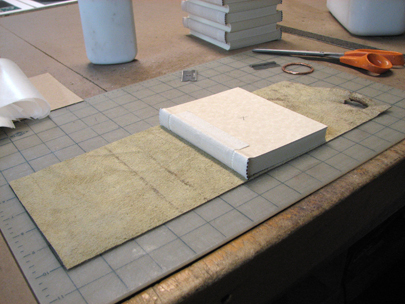 Endpapers are folded in half to a finished size of 4" wide by 5" tall. 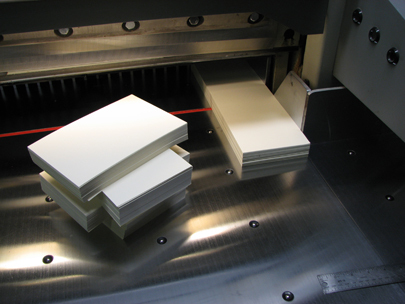 The endpapers are attached to the pages and the three outer edges of the pages are trimmed again in the paper cutter so that they are smooth and even. 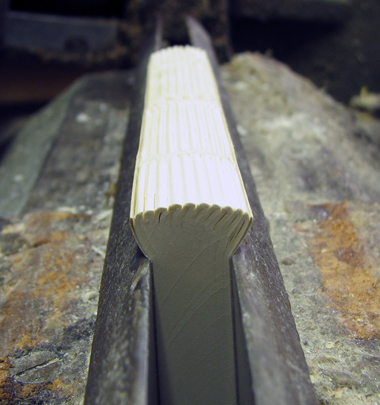 The book block is "rounded" using a backing hammer against the spine while pulling the front edge around the curve of my thumb to create the round. 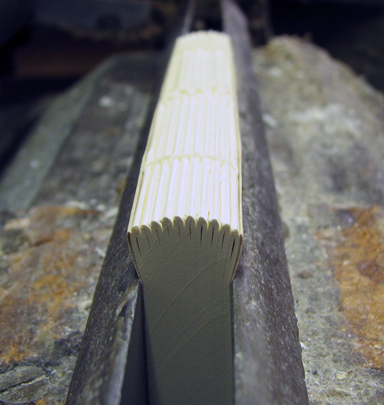 The rounded book block is placed, spine side up, in a rounding clamp. 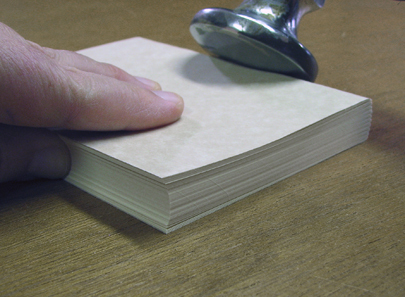 The edges of the pages are flared out over the edge of the clamp. This creates "ears" on the book. 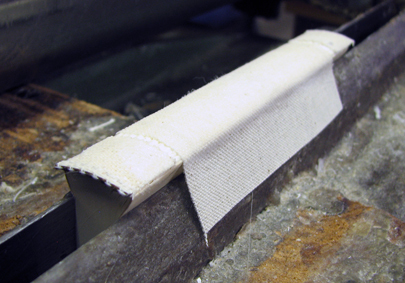 A piece of backing cloth is glued over the spine (this will reinforce the hinge where the book opens) and decorative cloth headbands are added to the top and bottom of the spine. 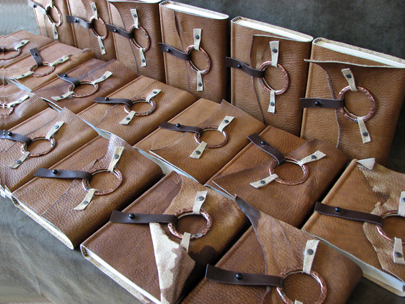 One large, special piece of cowhide leather was purchased to make the books in this limited edition. Purchased in Gallup, New Mexico and originally table-sized, it is just big enough to make 25 raw-edged leather covers for books this size. 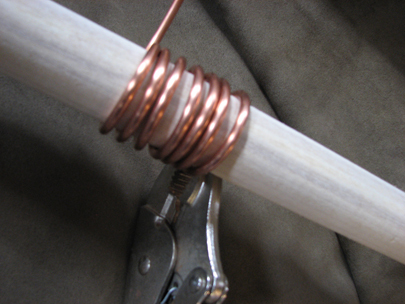 For the copper elements on the front covers, I start with a length of copper wire. The wire is wrapped around a dowel in the diameter I want. 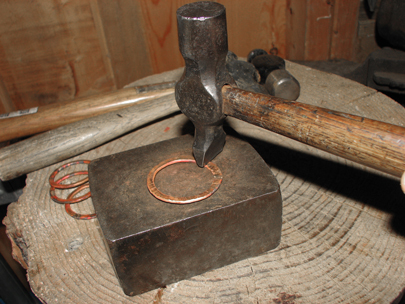 Removed from the wooden dowel, the coil of copper is cut by hand with a jeweler's saw to break the coil into multiple rings. 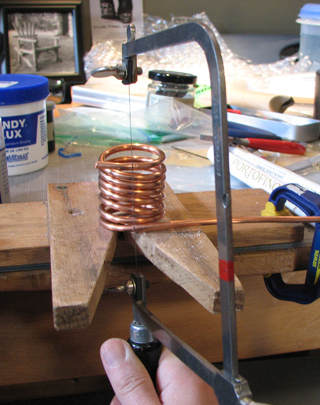 Here you can see the saw making cuts through the copper wire. 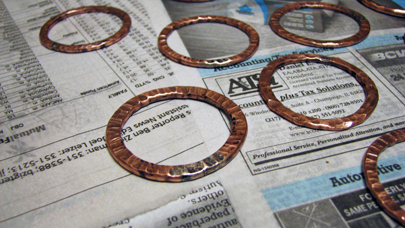 After sawing, I have a bunch of individual copper rings. This one was photographed sitting on top of a piece of railroad rail that I sometimes use an an anvil on which to hammer metal. 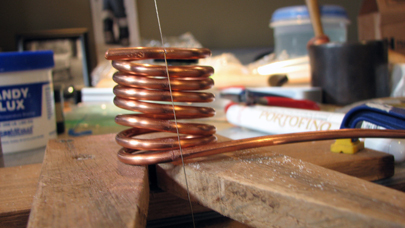 The ends of the copper rings are aligned using pliers, and soldering flux, as well as small chips of silver solder are applied to the open ends. 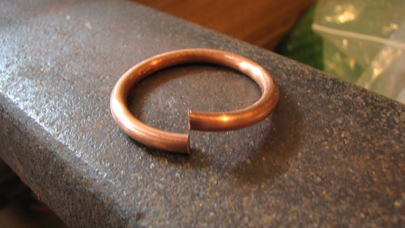 The copper ring is heated with an acetylene torch until the solder flows to close the joint. 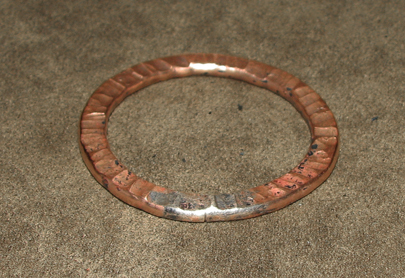 The copper ring as it appears after soldering. 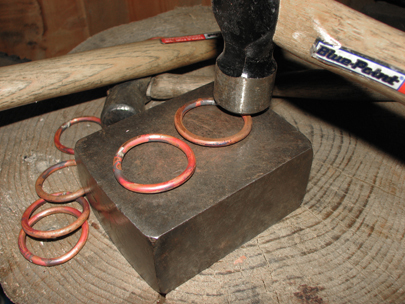 Each ring is hammered slightly flat on a steel block. 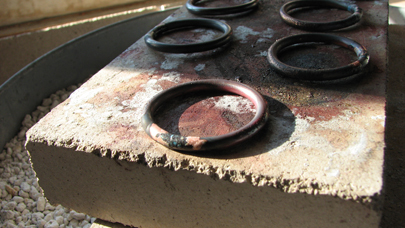 Each ring is then textured using different hammers to achieve different patterns in the metal. 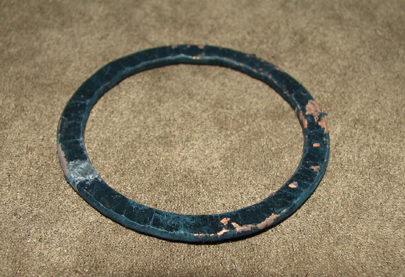 The hammered rings are oxidized using liver of sulphur for a black patina. Most of the patina is scrubbed off with very fine steel wool, leaving a satin finish and some dark areas from the patina that highlight the metal's texture. 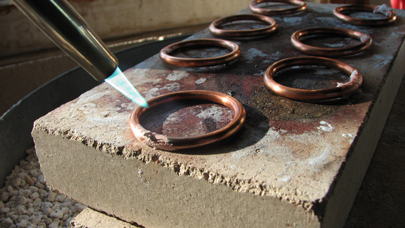 The completed rings are sprayed with clear laquer to seal in the finish and prevent further oxidation over time. 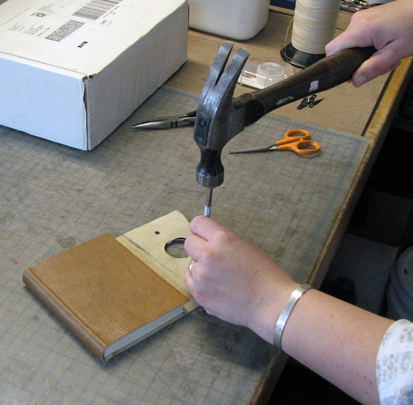 Each book block is centered on a piece of cut-to-fit leather. 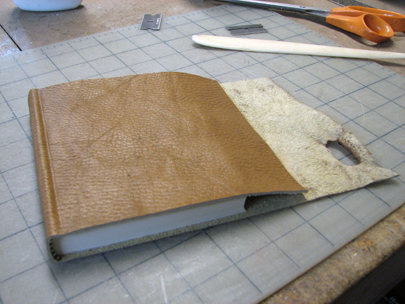 The book block is pre-glued to the leather along the crease near the spine. To permanently attach the pages to the cover, the endpaper and the backing cloth are brushed with a thin layer of archival poly vinyl acetate glue and pressed under a great deal of pressure. 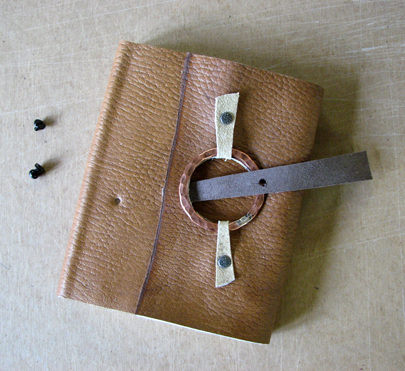 The overly-long front edge is trimmed and cuts are made in the leather to create tabs that will hold the copper ring on the cover. These cuts were made with an X-Acto knife. The copper ring is attached to the cover with rivets through those tabs. 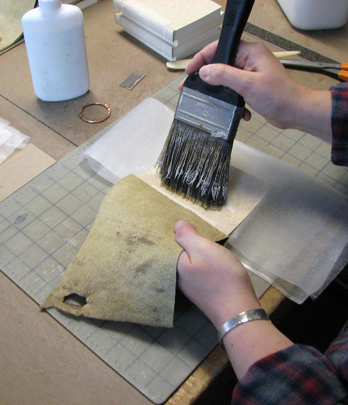 The closure straps for the books are cut from a separate piece of goatskin book leather in dark brown; the shape of each one drawn out on the back and cut out with a razor blade and a ruler. 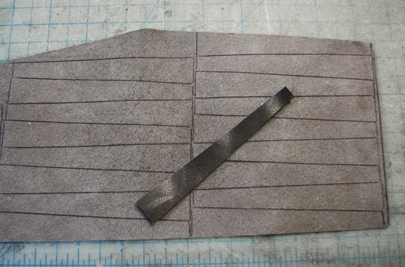 Finally, the closure strap is attached and the metal button closure hardware is screwed in place through the leather. 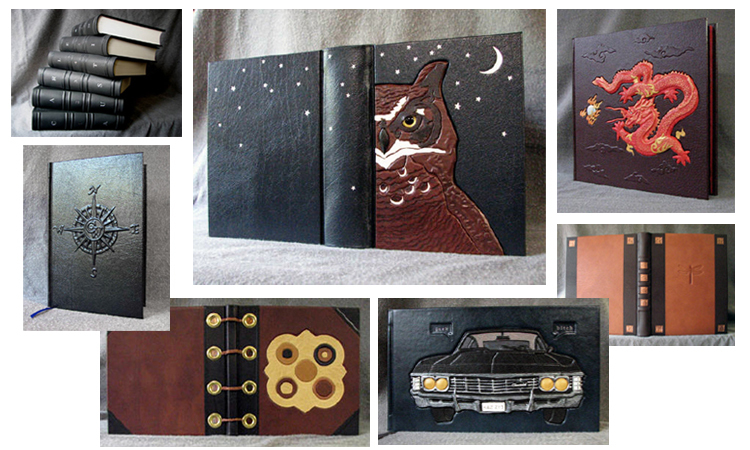 Here you can see the variations in the books made for this limited edition. For this special project, I printed a long scroll (38" long) with these in-progress photos and descriptions of the book being made. Each scroll was rolled and fits into a paper holder next to the spine of the book. The heavy paper wraps that protect each book and hold the scroll close using the same closure button that the book cover uses. 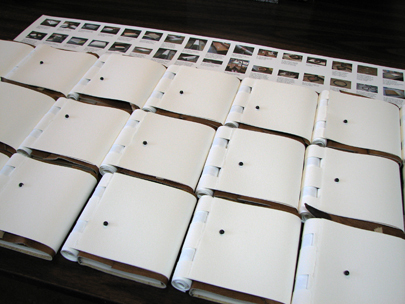 All of these wraps were cut by hand and each button placement varied depending on the book.